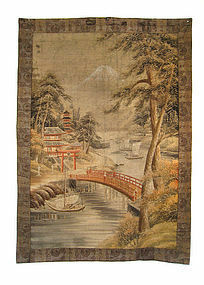 Antique Japanese large silk embroidered tapestry, view of temple with Mt Fuji rising out of mist in the background, large trees on either side of water with a bridge across leading to the temple, sail boats, huts on far bank, Autumn foliage on trees, some toning, silk border frayed, late Meiji Period. 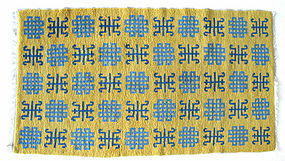 Total size (with border): 78" high x 55" wide Size (of embroidery only): 69" high x 46" wide. 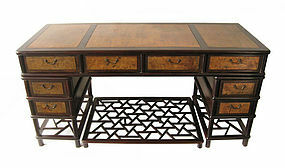 Large Chinese pedestal desk, 4 sections, 4 drawers across the top, each pedestal has 2 additional drawers on either side, separate foot rest with cracked ice design, made of dark hardwood with light hardwood burl in three panels on top of desk, light hardwood burl also used on drawer fronts and on the top panels on the sides and around the back of the desk, Republic Period. 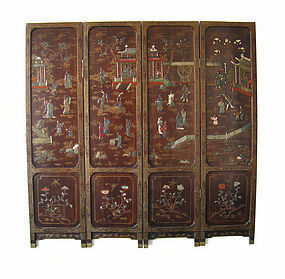 Size: 33 3/4" high x 69" wide x 27 1/2" deep. 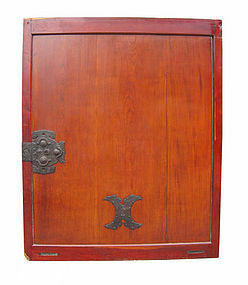 Antique Japanese large kura door, slatted on top, bottom has large keyaki (elm) wood burl panel, large iron lock in the shape of turtle rising up out of the water with mon (family crest), Meiji Period. Size: 81 3/4" high x 67" wide x 2 1/4" deep. 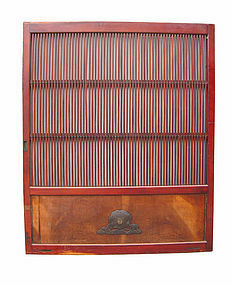 Antique Japanese large kura door (warehouse sliding door), made of solid keyaki (elm) wood with red-orange finish, two heavy iron locks, Meiji Period. Size: 81 3/4" high x 67" wide x 2 1/2" deep. 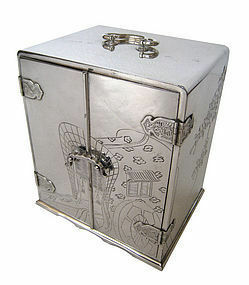 Antique Japanese small sterling silver box with handle, hinged doors on front decorated with incised design of lady's cart, sides decorated with blossoming plum branches, interior has four small wooden drawers with velvet lining and silver moko shaped drawer pulls, sterling mark on back, Meiji Period. Size: 6 1/4" high x 5 1/2" wide x 4 1/2" deep. 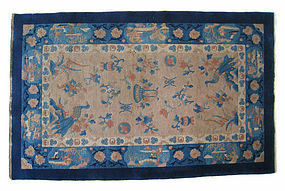 Antique small Chinese rug, dark and light blue repeating pattern on yellow ground, very nice condition, great colors, 19th century Size: 58" long x 31 1/2" wide. 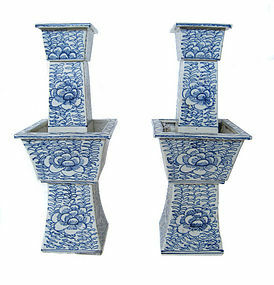 Antique pair of Chinese porcelain candle stands, painted with blue and white floral motif, square shape with double decker construction, 19th century. Size: 15 1/4" high x 6" wide x 6" deep.